This book represents the most up-to date guidelines on the basic aspects, the diagnosis and the treatment of the aortic pathologies that have been presented together in one publication. The first edition of Diseases of the Aorta has been well received by the medical community. The second edition of the Textbook has increased the number of pages from 430 to 675 and the number of chapters from 37 to 53. 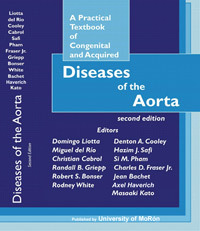 A section of Congenital Diseases has been incorporated and the new chapters on thoracoabdominal aneurysm, abdominal aorta and iliac arteries, traumatic injury of the thoracic aorta, spinal chord ischemia, endografting of descending aorta are extensively treated in the second edition. In addition , the contents of the first edition have been updated. At the dawn of the 21St century our scientific conscience is in sorrow in the lower realms of nature. We look as prejudicial minds athirst in the desert desperately searching for the footsteps of truth. The old belief from the late 19Th and early 20Th centuries stating that as modern science led to increase the understanding and intelligence of human beings it should avoid human hatred, persecution, terrorism, war, starvation and its effects in the body of mankind has been a misconception of life. It has been an illusion . It has been an error and error is always error. The standing of the harmony of being the dream of modern science has been a failure. Our work has not been a good job searching for certainty and well-being of mankind..
From the science our aim to understand the frightening world of today seems as if we were floundering in a swamp or gasping for air in the desert. However, it is here -in swamp or desert- that we must fight with bleeding footsteps our own war from the wisdom of modern science to give material support and spiritual compassion to the sick without discrimination in race and religious belief. Our aim must be to have them understood spiritually, for only this understanding and intelligence make truth be gained. We should examine ourselves and learn what the affection and purpose of the heart are, since this is the only way we can learn what we can honestly do to help in the marasmus of this century's world. It may be simply idealism in action in the frightening world of today and such a high aim is bound to fall short of the mark many times. However, we should remember the words of John Adams, written in February 1776- "We cannot ensure success, but we can deserve it". When the smoke of battle clears away of our own life we will discern the good that we have done. Comments from readers of "A Practical Textbook of Congenital and Acquired Diseases of the Aorta" are welcome.